MSRP or Price does not include $760 in destination charges. THE SIDE-BY-SIDES THAT DO IT ALL. The great outdoors isn’t like a golf course. You don’t get to drag around a bag full of clubs and choose one specialized tool for each job or adventure. At least not when you’re talking about side-by-sides. You often need one vehicle that you can count on in a wide variety of situations. One that puts a premium on versatility, striking a balance between size and capability, while still offering plenty of features. The answer: a Honda Pioneer 700. 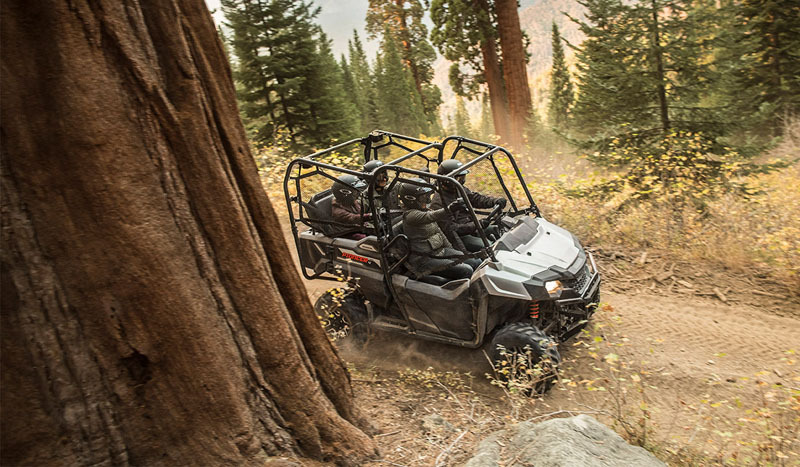 In terms of engine displacement and chassis size, it sits right in the middle of our Pioneer lineup—not too big and not too small. You can configure it to carry two or four people, and can further hone it with trim packages and other features. 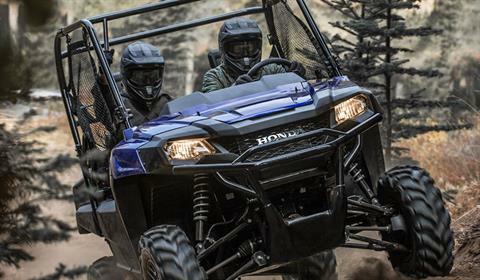 The overall size and Honda refinement means it handles like a dream—a claim few other side-by-sides can make. And maybe best of all, the Pioneer 700s are comfortable, a joy to drive in conditions that would wear you out on another side-by-side. CONTOURED BENCH SEAT: One of the most-used components of the Pioneer 700 is the bench seat itself. So we gave it a durable covering that can withstand the frequent entry and exit of passengers, and the elements. INDEPENDENT DOUBLE-WISHBONE FRONT SUSPENSION: Just like our rear suspension, the independent double-wishbone front suspension features dual-rate springs for smooth riding, superior handling and all-day comfort. And with 7.9-inches of travel, you can navigate the kind of rocky, rutted and uneven territory other side-by-sides can’t. 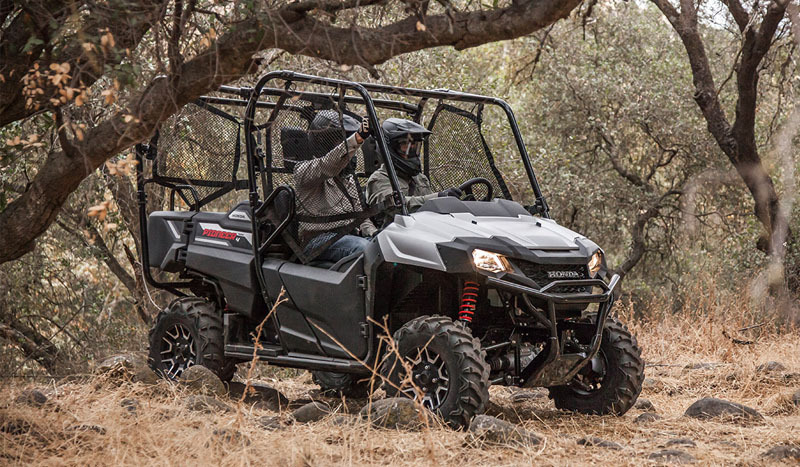 AT / MT MODE AND PADDLE SHIFTERS: With the Honda Pioneer 700 Deluxe and 700-4 Deluxe, you can let the automatic transmission shift for you, or you can take charge and choose which gear you want for yourself via the steering column mounted paddle shifters—you can even shift from auto to manual (AT to MT) on the fly! ADJUSTABLE PRELOAD REAR SHOCKS: You don’t want to compromise on handling, particularly when hauling heavy loads—and with our preload rear shocks, you don’t have to. The fully-independent rear suspension features a dual-rate spring and boasts 9.1-inches of travel. So even when loaded to the max, you’re assured predictable handling performance. HONDA AUTOMATIC TRANSMISSION: A vehicle this versatile demands a transmission that’s ready for anything. 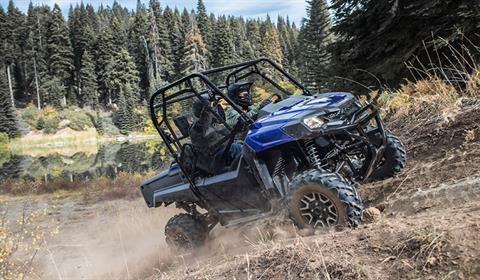 With a heavy-duty torque converter and three hydraulic clutches, you get smooth shifts, a steady stream of power, and engine braking. Meanwhile, the two-stage shift map further optimizes power and torque delivery, even at higher RPM ranges. 1,500-POUND TOWING CAPACITY: Sometimes you need to tow things. Like, up to 1500 pounds of things. 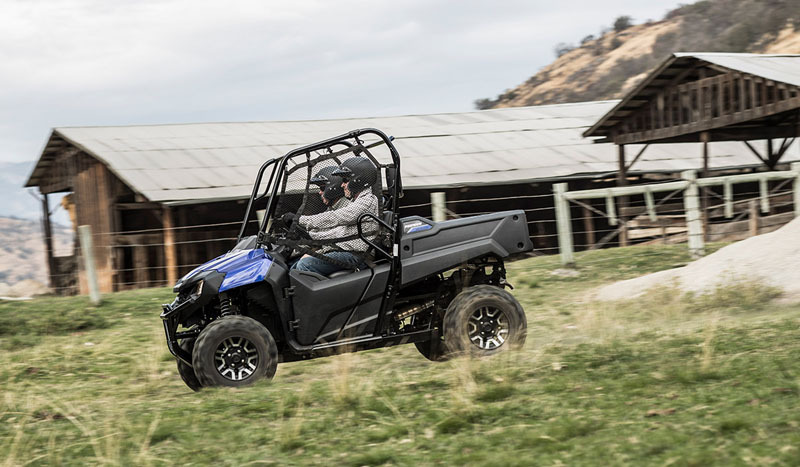 So we gave the Pioneer 700 a robust three-quarter-ton towing capacity—strong enough to handle some of those jobs you’d normally use a tractor for. DISC BRAKES: Mud, turf, gravel – you can handle every bit of it with confidence and still stop with confidence. Our triple-disc brakes feature a patented scraper system that helps prevent debris buildup between caliper and rim. 200mm discs in the front, and lighter, 170mm inboard-mounted disc in the rear deliver stellar stopping power. 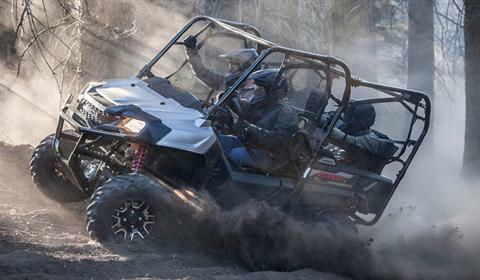 RUGGED 675 CC LIQUID-COOLED ENGINE: Power to go further, and to keep on going. That’s what the 675cc four-stroke single delivers. Rubber-mounted for less cabin vibration. Fuel-injected for reliable starts and performance in inclement weather. And proven reliability for hunting down thrill after thrill. 1,000-POUND BED CAPACITY: In many ways, this isn’t a just side-by-side. It’s a solution. 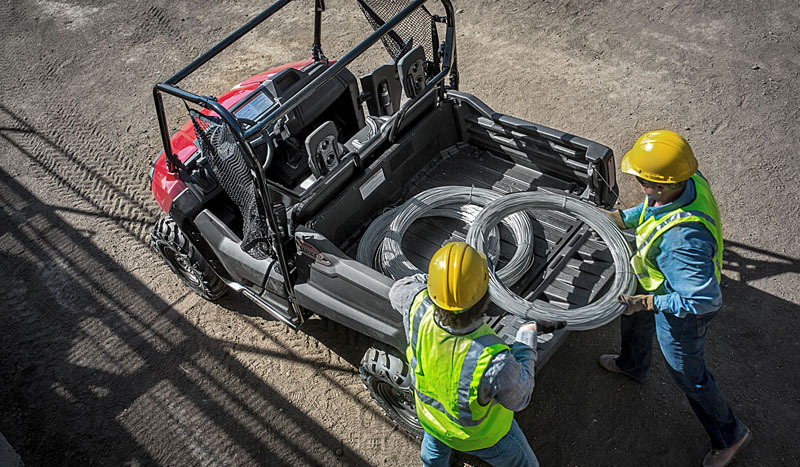 Take the cargo bed—the 1000-pound capacity is among the tops in the industry, and it’s made of a strong, durable construction. That means more cargo in fewer trips, saving you time. Now that’s smart. DRIVER / PASSENGER PROTECTION: Staying safe is essential, both at work and when having fun. That’s why the Pioneer 700 is equipped with an Occupant Protection Structure, using large-diameter tubing and meeting OSHA’s rollover protection standard. And in the cabin, integrated handrails, recessed top tubes and automotive-style three-point seatbelts with emergency locking retractors help keep passengers securely in place. 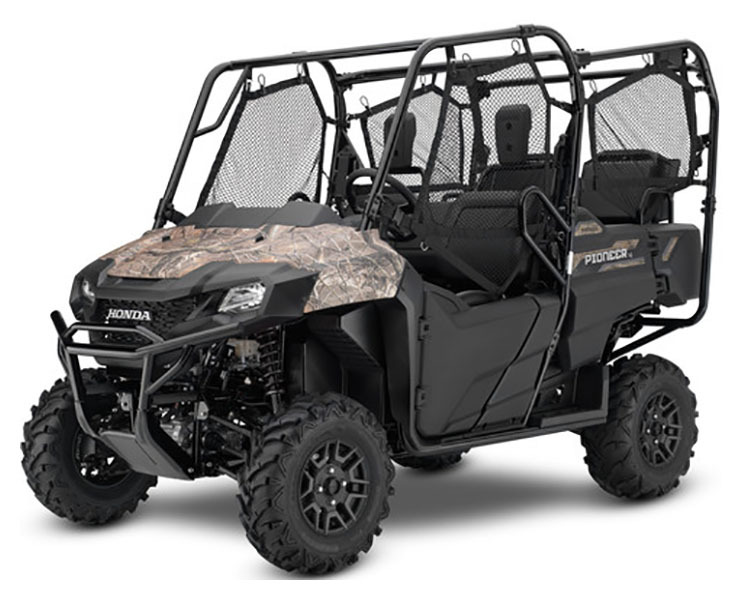 A VARIETY OF COLOR CHOICES: Some hunters and outdoorsmen are going to go straight for the Pioneer 700-4 Deluxe model in Honda Phantom Camo®. For others, a Honda has to be Red. But there are some other great choices too. 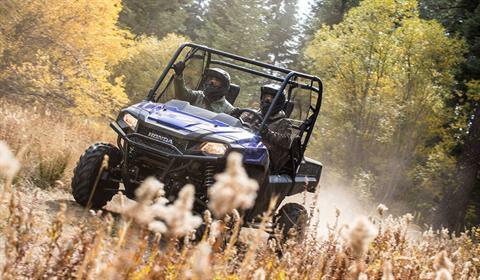 When you choose either the 700 Deluxe in Pearl Orange or the 700-4 Deluxe in Diver Blue, you get true painted bodywork, which is tough and resists superficial scratching, so your Pioneer 700 looks better longer. GLOVEBOX: In the cabin, a convenient glovebox holds your essentials and keeps them dry. The water-resistant door helps prevent the elements from getting inside, while the in-dash design provides good storage space, without compromising on passenger legroom. DOUBLE-LATCH DOORS: Knowing you’re driving a side-by-side built with safety in mind makes the adventure that much more fun. Our hard doors feature a double latching system designed after our autos. They work together with our roll-up side nets, helping to keep the elements outside and you secure inside. TILT BED: With the cargo bed’s large capacity and durable construction, we’ve made hauling heavy loads easy. So it makes sense that we’d make dumping the load easy, too. Thanks to the smartly-designed hydraulic assist strut, you can tilt the bed and dump the cargo, even with one person. 37.5-WATT HEADLIGHT: Whether you’re up for work before sunrise or heading home late after a day on the trails, the Pioneer 700’s headlights will light your way. 37.5 watts and single filament, they have an excellent balance and light distribution, so you don't have to deal with dark zones or uneven light patterns. QUICKFLIP® SEATING: Versatility is the defining feature of the Pioneer 700-4 and Pioneer 700-4 Deluxe, and nothing illustrates that better than our industry-exclusive QuickFlip seating system. Switch between 2-person mode with full cargo and tilt bed functionality, to 3-person mode, to 4. Seats lay flat in the bed, and pop up in an instant whenever you need them. 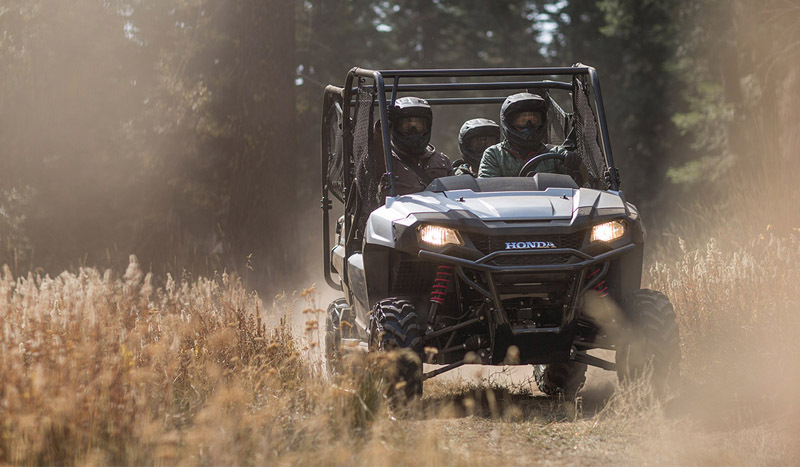 450-WATT POWER CAPACITY: Every component on the Pioneer 700 is engineered to perform at the highest level. The alternator is no different—with 450-watts, it has plenty of power for everyday use and has enough left over for accessories that help you work easier, like winches, light bars and more. Always consult accessory instructions for specific power requirements. Curb - 1,426 lb. - Includes all standard equipment, required fluids and full tank of fuel. Recommended for Drivers 16 years of age and older.